Added by Charles-Eric Vilain X.
which champagnes were tried here..? On this picture we were trying the same champagne in different glaces. It was just a great experience as everybody thought this were 4 different champagnes. We are usually working with small producers. Every month I invite you to taste special and exclusive champagnes from small producers and we will pair this with high quality chocolates. As I go every 3 weeks to the Champagne Region I always make new and interesting discoveries. 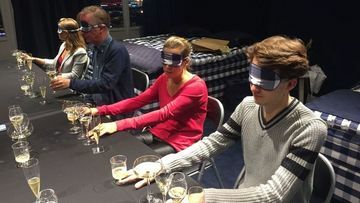 Ones in a while we will taste other wines as well and also do, on a regular basis, blind tastings in order to better understand the differences and find out your preferences.